Chinese LED maker MLS as a potential purchaser of Taiwanese LED chip manufacturer Epistar has become the latest story in Taiwan LED industry. Following the market rumors, the LED chip makershares have soared, giving the LED stock market a major push. Market rumors claim Chinese manufacturers potential investments in Taiwanese companies have allowed local LED enterprises to evaluate their market value again. 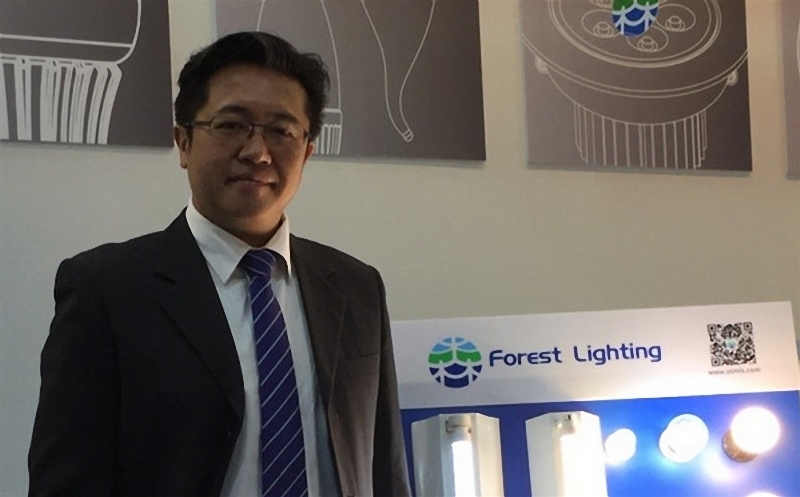 However, some interviews with local market research companies showed the chances of MLS acquiring Epistar was fairly low, and the Chinese company current focus was mostly turned towards bidding Osramlighting business. A senior MLS official also said, "We currently do not have any plans (to buy Epistar)." Epistar current share value is NT$ 20 (US $0.61), but its net value is estimated to be over NT $50. For interested buyers, Epistar relatively low share value makes it a worthy investment. Analayses by a Hong Kong investment company also supported the perspective that Epistar was a good investment that could potentially attract Chinese companies or other foreign investors. Forest Lighting or also known as MLS senior officials have denied market rumors of purchasing Epistar. MLS General Manager Lawrence Lin posing during a recent photo shoot at Taipei Building Show. A closer inspection of Epistar operations indicate its LED chip prices are still at a low point on the market, and the company might be forced to further lower prices, due to its high inventory stocks. The future outlook for Epistar remains unoptimistic, and the company needs to solve low profitability issues for its low to mid class LED chips used in LED lights applications. Besides, the company needs to actively develop highly value-added LED chips for high end LED lights applications, and niche market applications. For large Chinese LED enterprise MLS, current market pricing conditions makes purchasing LED chips and LED dies a more economic choice over purchasing a new company. If MLS merged with a Taiwanese LED company, it will need to solve MOCVD depreciation issues. This would place it at a disadvantage compared to other Chinese epiwafer manufacturers that are heavily supported by the local government, such as San an Opto. Additionally, LED patents is another issue that industry insiders have been considering about. Epistar has signed cross-patent license agreements with large international LED players including Cree, Philips, Lumileds, and Toyoda Gosei. If MLS acquired Epistar, they would not be able to transfer the cross-licensed LED patents to a third party company, in this case MLS. This was clearly stated in the cross-patent license contract. But, Osram has rosed its R&D investments in LED production, it still plans to sell its lighting business, which covers its lighting brand, distribution channels, and manufacturing sites. The sell package has attracted buyers including Tsinghua Tong Fang, ETI and MLS. The first two companies are LED epiwafer manufacturers that are much smaller than San an Opto, by buying Osram lighting business these companies will be able to vertically integrate their supply chain, or in other words vertical integrations. These two companies will be able to increase their LED exports, which would be beneficial to their companies. MLS on the other hand, is already China largest LED encapsulation manufacturer and by acquiring Osram lighting business it will be achieve even greater effects. If MLS can successfully acquire Osram lighting brand and distribution resources, the company would be able to expand exports to the European market. It is estimated the company would spend about US $1 billion to $2 billion on the purchase plan, compared to acquiring Epistar at its current market value, it would be more helpful for MLS to buy Osram lighting business. By absorbing Osram lighting business, MLS will have more grasp over markets in Europe, China and even some Asian markets in the future. Taiwanese Investment Commission review has is another reason behind MLS reluctance to purchase Epistar, the possibility of the commission approving the purchase is very low. It would be possible for MLS to become an Epistar shareholder, which would work in favor for both companies virtual integration strategies, and bring their partnership closer.